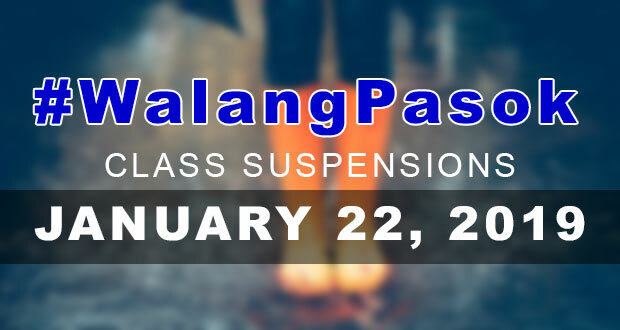 Classes for both public and private schools will be suspended in select areas on Tuesday, January 22 due to tropical depression Amang. According to the 4 PM weather bulletin of PAGASA, tropical depression Amang is currently slowing down and it’s expected to be relegated back to low-pressure area in the next twelve hours. In the 8PM weather bureau advisory, Amang was spotted at the 85 kilometers east of Catarman, Northern Samar. Signal No. 1 has been lifted in all areas. Light to moderate rain will still be experienced in the areas of Catanduanes, Camarines Sur, Albay, Sorsogon, and Northern Samar. PAGASA continue to warn that heavy rains are still possible in those mentioned provinces.